Understanding the basics of the family office industry is essential if you want to succeed in establishing a successful fund for a wealthy family. That's where The Family Office Book comes in. 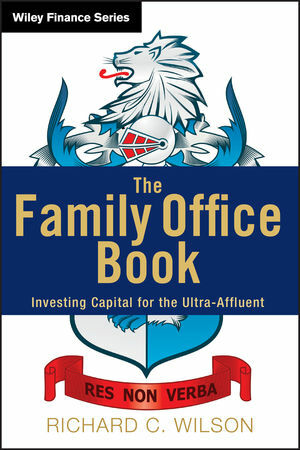 Outlining key strategies for family offices, from what a family office is to how the industry operates, and important global differences, the book is packed with interviews with experts from leading family offices. Providing readers with need-to-know tips and tools to succeed, The Family Office Book gives current and future practitioners everything they need to know about this popular segment of the financial industry. A comprehensive and reliable resource, The Family Office Book details exactly how family offices are choosing investment managers and why, and how, to break into the industry. RICHARD C. WILSON works with single and multi-family offices and the ultra-wealthy on a daily basis. Richard's team at the G.T.C. Institute, LLC operates the 40,000 member Family Offices Group association, a newsletter called Family Office Monthly, and the Qualified Family Office Professional (QFOP) training program. Richard also has a team that is laser-focused on connecting family offices to best-of-breed fund managers. Richard is a global speaker on family offices having spoken at and chaired more than 50 industry conferences and summits in Zurich, Monaco, Singapore, Moscow, New York, Liechtenstein, Sao Paulo, Tokyo, and the Cayman Islands.